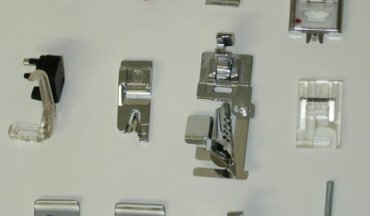 Probably the most common sewing problem is getting correct sewing machine tension. By thread tension, we mean the amount of thread that can pass through the machine to create the stitch. The more thread in the stitch, then the looser the stitch. The less thread, then the tighter the stitch. Top thread tension is controlled by a dial on the machine’s thread path. So make sure the thread sits correctly between the tension discs when you’re threading your machine. If it doesn’t, then the machine won’t be able to sew properly. When your presser foot is up, the tension discs are open and there is no tension on the top thread. That’s why you get lots of loops when you try to sew with the presser foot up. But it does help to get the thread between the discs when you have the foot up as you thread the machine. Thread tension is such an important issue but is commonly misunderstood, so that’s why I include it in my Beginners Sewing classes. To make a correctly-formed stitch, the machine needs a top and bottom thread. These threads need to work in harmony with each other so they interlink exactly in the middle of the fabric. If there is an imbalance, then one will pull the other through to the other side of the fabric. This will cause a poor quality stitch that may not hold. As the bobbin thread tension is factory-set and wouldn’t usually be adjusted for normal sewing. So we’ll be talking only about the top thread tension since that’s where you’d usually make the adjustments. The dial settings run from 0 to 9, so 4.5 is generally the ‘default’ position for normal straight-stitch sewing. This should be suitable for most fabrics. If you are doing a zig-zag stitch, or another stitch that has width, then you may find that the bobbin thread is pulled through to the top. It may show at the sides of the stitch and the fabric is slightly raised or bunched. If you see this, slacken off the tension slightly (perhaps to between 3 and 4). Then the fabric will lie flatter. It also helps to loosen off the top tension a little if you are topstitching and want the stitches to be more of a feature. Tension settings vary slightly between machines. The thickness of the thread and weight of the fabric will also have an effect on the tension. So don’t be afraid to experiment and find the setting that’s best for your specific project. 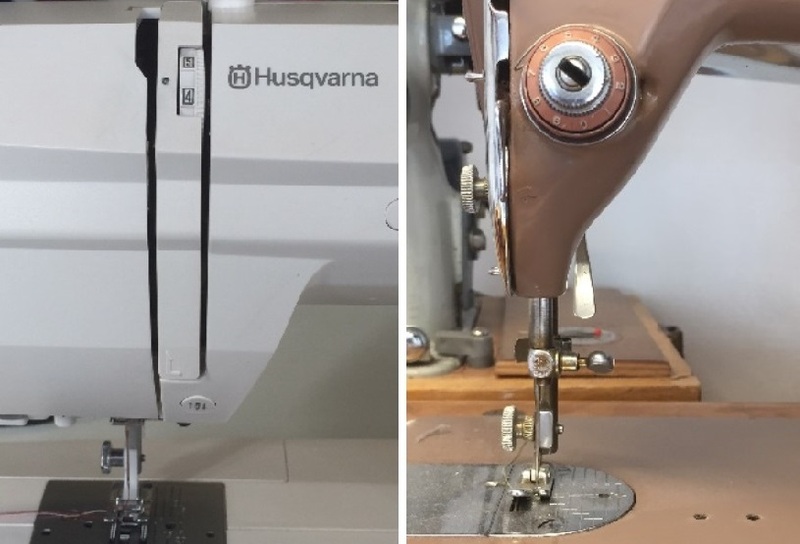 It can be difficult to know what’s wrong with your sewing machine tension. So if you thread up using a different colour in the top than you’re using in the bottom, it’s easy to diagnose sewing machine tension problems. 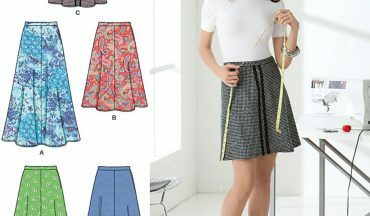 If a thread is too loose, then it’s not connecting with its partner in the fabric to form the stitch correctly. In the diagram above, the bobbin thread is lying along the fabric instead of being pulled up into it. It may even be able to possible to pull out the bottom thread. If you have a drop-in style bobbin, then you shouldn’t ever need to change the bottom tension. It’s unlikely to have been altered from its factory setting unless you’ve done it yourself. To do so, you’ll need to remove the needleplate, which will enable you to take out the bobbin case. You’ll then have access to the bobbin tension screw. If you’ve got a front-loading bobbin that has its own removable bobbin case, it’s more likely that the screw can be moved – even accidently. So it may not be at the factory settings. To test if the tension is correct, insert a bobbin in the bobbin case. Then hold it up by just the thread, the bobbin case shouldn’t move. Give a little jerk on the thread and if the bobbin case slides down slightly, then the tension if perfect. If it drops freely, then it’s too loose. If it doesn’t move at all, then it’s too tight. 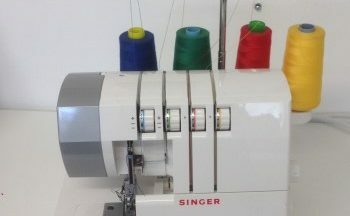 Final note: Exciting effects can be achieved by utilising tight and loose tension settings on your sewing machine when doing free-machine embroidery. If you don’t understand the effect each thread tension has on the other, then consider my taking my Free-Motion embroidery workshop which will teach you a lot about how to use your sewing machine. Start ’em Young. 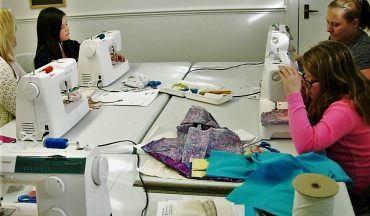 Sewing Classes for Children.